Here you’ll find answers to frequently asked questions about the 23rd Annual Webby Awards ceremony and the events surrounding it. Q: HOW DO I KNOW IF I’M A WEBBY AWARD WINNER? 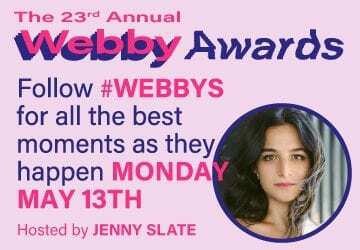 A: All Winners are announced on webbyawards.com on Tuesday, April 23, 2019. If you are a Winner, you will be notified directly via email and postal mail. You can also see the full list of winners here. Q: HOW DO YOU CHOOSE WHICH SPEECHES WILL BE IN THE WEBBY AWARDS SHOW? A: There are a couple of ways to make the stage at The Webbys to deliver your 5-Word Speech. We’re looking for speeches that show off how much creativity can be packed into only five words. You can be funny, topical, inspirational, outrageous or just about anything else you can think of. The most important part is to be memorable. If you think your speech has what it takes to be included in the show, email us your idea at pickme@webbyawards.com. A few will be selected to be delivered live at the show on May 13, 2019. For inspiration, visit our YouTube channel to look through some of the speeches from previous years; and check out our 5-Word Speech and Sharing Tips resource. Q: CAN I STILL GIVE A 5-WORD SPEECH IF I CAN’T MAKE IT TO 5-WORD SPEECH DAY? A: There will be a dedicated slot for some Winners to record their speeches before the show. Please inquire with Emma Whitfield at emma@webbyawards.com. These will be assigned to those who cannot make it on Sunday, May 12, 2019. Q: DOES IT MAKE A DIFFERENCE IF I’M A WEBBY WINNER VS A PEOPLE’S VOICE WINNER? A: Not at all. Every Winner is equal at The Webby Awards, and everyone will have a chance to record their 5-Word Speech. Q: ARE ALL WINNERS INVITED TO THE WEBBY AWARDS CELEBRATION? Q: HOW DO I ATTEND THE WEBBY AWARDS SHOW ON MAY 13th? A: All instructions about how to get your Webby Awards tickets as a Winner have been provided to you directly in your Winner’s kit. Every winning organization receives a voucher valued at $495 to put toward table and ticket packages. You can get your table and ticket packages and read all about this year’s show here. A: You can always get in touch. Feel free to reach out to Emma Whitfield at 646-918-5003 or emma@webbyawards.com. A: You can wear whatever you’d like! But remember, your team will be recorded and the speeches will be uploaded to YouTube and shared on social, so make sure your clothes represent your organization in the way you want. Q: HOW MANY PEOPLE CAN RECORD A 5-WORD SPEECH? A: There is no limit to the amount of people who can record a 5-Word Speech. Just make sure to include all their names and job titles when filling out the 5-Word Speech booking form. A: Yes, we will be serving light food and drinks. Q: WHEN WILL I GET TO SEE MY SPEECH? A: All Winners will receive your Webby 5-Word Speech, fully optimized for sharing on social, on Monday, May 13th. We encourage you to share your 5-Word Speech on your social channels on the night of the event using #Webbys to give it the most visibility. The Webby Awards will also share your speech. Q: I CAN’T MAKE 5-WORD SPEECH DAY ON SUNDAY. CAN I RECORD MY SPEECH ON MONDAY? A: Yes, you will have the option to record your speech at Cipriani before the show, but spots are limited. A: The dress code is Sunday Formal. What does that mean? Check out our Flickr page from past years’ Sunset Cocktails. A: Yes, guests will be served dinner at the show. Q: WHAT DO PEOPLE TYPICALLY WEAR TO THE SHOW? A: We like to call our dress code “creative formal.” Check out the gallery below to get an idea of what that means.